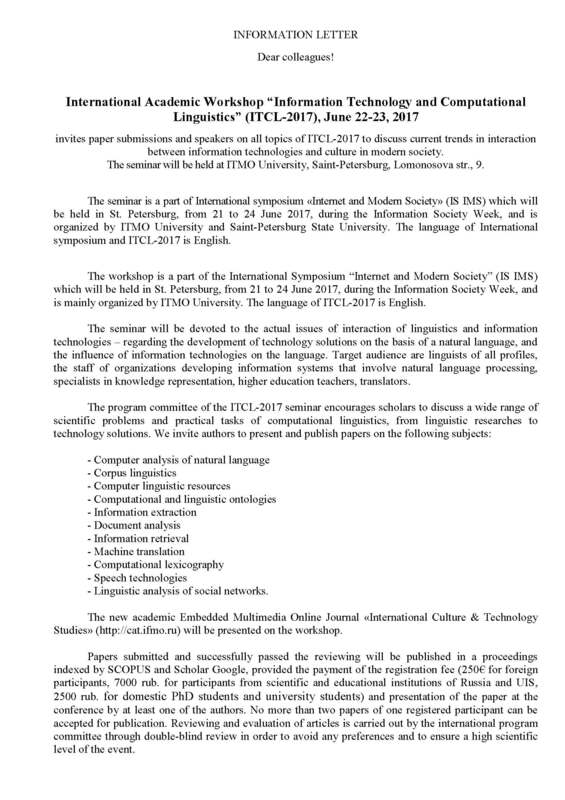 International Academic Workshop “Information Technology and Computational Linguistics” (ITCL-2017), June 22-23, 2017 invites paper submissions and speakers on all topics of ITCL-2017 to discuss current trends in interaction between information technologies and culture in modern society. The seminar will be held at ITMO University, Saint-Petersburg, Lomonosova str., 9. The seminar is a part of International symposium «Internet and Modern Society» (IS IMS) which will be held in St. Petersburg, from 21 to 24 June 2017, during the Information Society Week, and is organized by ITMO University and Saint-Petersburg State University. 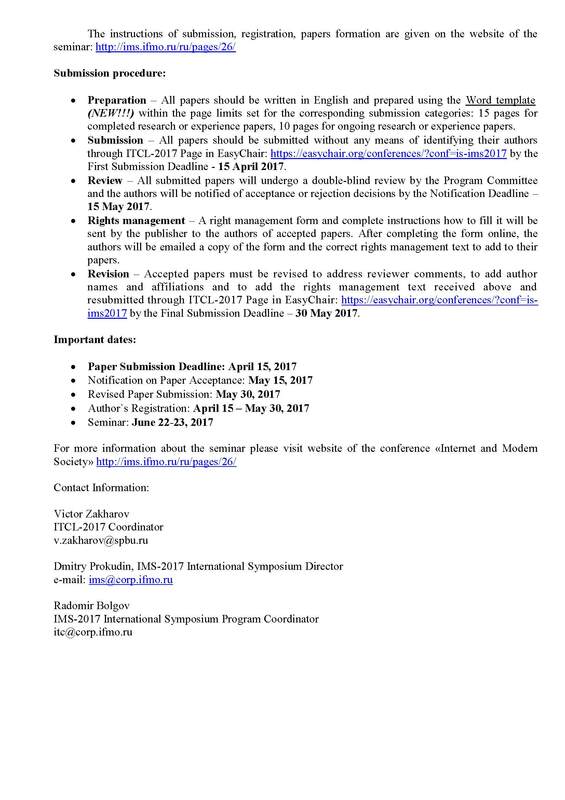 The language of International symposium and ITCL-2017 is English. The workshop is a part of the International Symposium “Internet and Modern Society” (IS IMS) which will be held in St. Petersburg, from 21 to 24 June 2017, during the Information Society Week, and is mainly organized by ITMO University. The language of ITCL-2017 is English. The seminar will be devoted to the actual issues of interaction of linguistics and information technologies – regarding the development of technology solutions on the basis of a natural language, and the influence of information technologies on the language. Target audience are linguists of all profiles, the staff of organizations developing information systems that involve natural language processing, specialists in knowledge representation, higher education teachers, translators. – Linguistic analysis of social networks. The new academic Embedded Multimedia Online Journal «International Culture & Technology Studies» (http://cat.ifmo.ru) will be presented on the workshop. Papers submitted and successfully passed the reviewing will be published in a proceedings indexed by SCOPUS and Scholar Google, provided the payment of the registration fee (250€ for foreign participants, 7000 rub. for participants from scientific and educational institutions of Russia and UIS, 2500 rub. for domestic PhD students and university students) and presentation of the paper at the conference by at least one of the authors. No more than two papers of one registered participant can be accepted for publication. Reviewing and evaluation of articles is carried out by the international program committee through double-blind review in order to avoid any preferences and to ensure a high scientific level of the event. Revision – Accepted papers must be revised to address reviewer comments, to add author names and affiliations and to add the rights management text received above and resubmitted through ITCL-2017 Page in EasyChair: https://easychair.org/conferences/?conf=isims2017 by the Final Submission Deadline – 30 May 2017. This entry was posted on March 31, 2017 at 8:34	and is filed under NEWS & EVENTS. You can follow any responses to this entry through the RSS 2.0 feed. You can skip to the end and leave a response. Pinging is currently not allowed.